14 January 2019 – Philippine Ambassador to Singapore Joseph Del Mar Yap proudly announces the launch of the official logo and tagline for the 50th anniversary of Philippines-Singapore relations this year. The logo was chosen from 37 entries submitted in a competition jointly conducted by the Philippine Embassy in Singapore and the Singapore Embassy in Manila from 12 October until 09 November 2018. The winning entry is from 23-year-old Filipino freelance graphic artist, Mr. Renante Tatel Corporal. His design was inspired by the “Griffin”, a mythological creature which is half-eagle, half-lion. The eagle represents the Philippines, as exemplified by the Philippine Eagle which is the national bird. The lion represents Singapore, with the Merlion being the popular symbol of the city-state. The griffin is bathed in gold to symbolize the golden anniversary of their relations, while the wings represent each of the two countries’ respective flags. “At a time when the Philippines and Singapore are about to celebrate a milestone in our partnership, it is indeed a proud moment to have a kababayan capture the essence our bilateral relations through Mr. Corporal’s design,” Ambassador Yap said in his congratulatory message. With the hashtag #PHSG, the official tagline for the Philippines will be “Perfect Harmony, Shared Goals”. 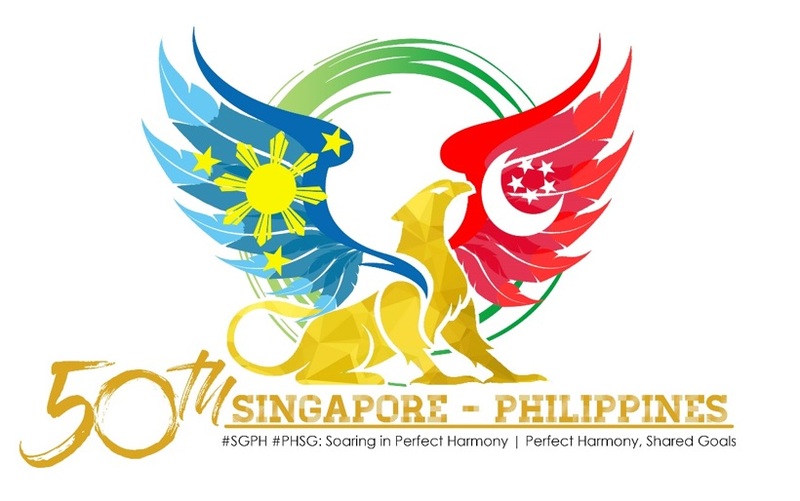 Singapore will be using the hashtag #SGPH, with the tagline, “Soaring in Perfect Harmony”. Both the Philippine Embassy in Singapore and the Singapore Embassy in Manila simultaneously launched the official logo and tagline. A year-long schedule of activities will be organized by the Philippine and Singapore embassies in their respective jurisdictions to commemorate this important milestone in our bilateral relations.